After giving up 79 points in the season opener, the focus for UCF against Gardner-Webb was to improve its defense. Wednesday night, the defense looked more like the nation-leading force from a season ago in the Knights’ 68-65 win over the Bulldogs. “I was happy that we’re starting to work in to the right direction defensively, getting back to UCF defense and that’s what we have to get to. We’re not there yet, but we’re trending towards how we want to defend,” coach Johnny Dawkins said. The Knights, while still trying to figure out line-ups, were once again shorthanded. They were without center Tacko Fall – who did dress for the game – point guard B.J. Taylor, who is out 4-6 weeks with a fractured foot, and lost guard Ceasar DeJesus to cramps early in the second half. 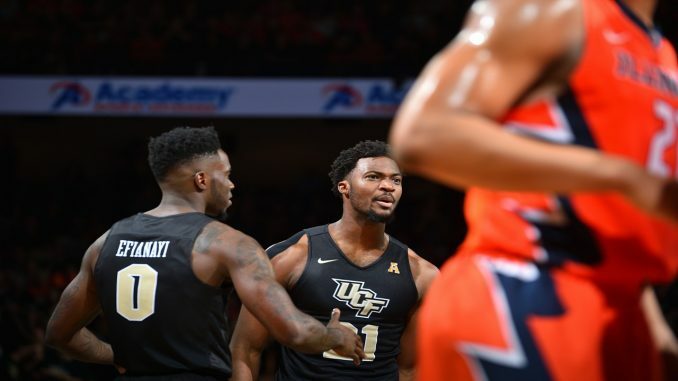 The offense wasn’t nearly as efficient as what was seen in the 88-point performance in the season opener, as UCF shot 39 percent for the game, including 2-15 from three. They also only had five assists while turning the ball over 16 times. Thanks to 27 Bulldog fouls, the Knights were able to score 28 points on 40 free throws. “We’re a better shooting team than our numbers show right now. That I know. I watched us enough this offseason and I’ve watched us enough in the practices leading up to this game, you know, we’re a better shooting team than we’re shooting right now,” Dawkins said. The Knights shot only 33 percent in the first half, struggling their way to a 31-28 halftime lead. After scoring four quick points in the first minute of the game, UCF went nearly eight minutes without making a shot from the field. After Gardner-Webb took a 10-6 lead with 13:22 left in the half, a mini run fueled by Ceasar DeJesus and Chad Brown gave UCF the lead back. The Knights maintained the lead, largely off the back of 18 first half free throw attempts and their defense. UCF was able to hold the Bulldogs to 33 percent shooting in the half, as well as limiting them to just one three pointer. UCF switched things up in the second half, going with a smaller lineup and pressing higher up the court to increase the pace. The Knights’ scoring picked up as a result, and they were able to shoot a better 46 percent in the second half. The Bulldogs however, were able to counter every attempt the Knights made to pull away, and eventually took a three-point lead with 12:53 left in the game. Minutes later, the Knights found their breakthrough. Halfway through the second half with the game tied at 45-45 the Knights went on a 15-3 run in the next four minutes to take a 60-48 lead. Key to this run was the defense of center Chad Brown and forward A.J. Davis, as well as the scoring of Dayon Griffin who had 10 of his 12 points in the second half. The Bulldogs made it interesting late, as they were able to hit back-to-back threes to make it a one-point game late. After guard Terrell Allen made two free throws, Gardner-Webb’s Liam O’Reilly missed a game tying shot at the buzzer. The Knights had four players who finished in double figures, but were really led by Davis – who finished with 15 points, 10 rebounds and three blocks – and Brown – who finished with 10 points, including 8-10 from the free throw line, 10 rebounds and five blocks. The Knights are back in action Saturday night when they take on Williams and Mary.